For over a decade, our friends have run a summer Christian camp on an Indian reservation just to the east of Glacier National Park. A few days ago, Matt and I made the two-hour road trip through Glacier Park, to visit the camp. It’s a breathtaking property, with over 100 different kinds of wild flowers growing among the grasses, backed by a sky-scraping mountain range. A river wanders through the middle of the land, perfect for campers on inner tubes. After watching the campers do some activities, we took the 50-cent tour around the place. I wish I had taken a picture of the outdoor chapel, with its peek-a-boo view of mountain peaks. Last stop on the tour was a harrowing journey through some marshland, to go see a beaver dam. I say harrowing, people. The librarian’s daughter trekking through tall growth, with soggy ground and 368 types of insects swarming my head? You’re okay. You’re okay, I said to myself. In a few places in the marshland, our guide pointed out some tree stumps that had been symmetrically chiseled by teeth. I’ve seen men chop a tree with those kinds of strokes, but I would like to have seen a beaver manage that with his mouth. Then we broke out of the growth and looked down. Below us was the river, and just a ways upstream was the substantial beaver dam. It was my first time ever to see a beaver dam, and it was a really neat field trip –minus the field part. Those beavers had stacked up so much wood that they had created a very large pond that backed up to their lodge. Did you know that a beaver lodge needs two or three feet of water over it, so it doesn’t get blocked by ice in the winter? 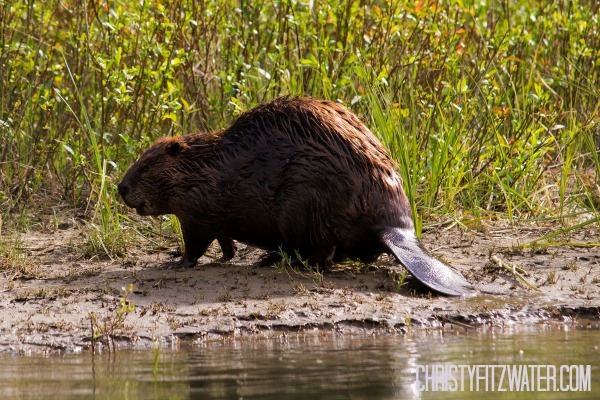 Did you know beaver dams create a new ecosystem? Did you know beavers can repair a dam overnight? We have friends who are ranchers, and they don’t take so kindly to beavers and their water-blocking ways, but I wasn’t thinking about that, as I looked down on the large, animal-made pond. I was just thinking that God is an amazing creator. In the work of the beavers, I could understand something about God’s invisible power and who he is. He made one animal that could create a new ecosystem for so many other animals. Something in this design speaks to me of the power and building nature of God. What have you seen in the world this summer that has helped you more clearly understand who God is? I live in Vermont, where it is beautiful all the time, even though I complain when it’s cold and when it’s hot. We have 4 seasons and each are uniquely beautiful. I had a brain aneurysm in 1991 that made me blind. Operations (and God) on the right eye made me see in the left eye, but still blind in the right! Every day there is something to thank God I can see. What joyful words, to hear you thankful for what you can see. Thank you for sharing, Jeannette! I love being outside admiring His wonderful work. Seeing His mighty work in this world He’s given us brings both humility and security to me. We are so blessed to live in Montana, one of the most beautiful places on earth. Thanks for this reminder to keep our eyes open so we can see His glory all around us. Have a wonderful day?